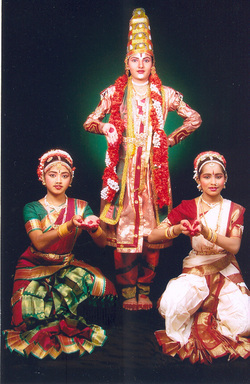 All Kuchipudi performances begin with Rangapuja . The Rangapuja composed by Guru Smt. Vijaya Prasad is unique . It contains all the rituals as described in the Natya Shastra's Poorvaranga, such as Ranga samprokshanam, Dhwajavandanam etc. Traditionally in Dashavtar the performer depicts the 10 incarnations of Lord Vishnu. Vijaya Prasad composed this item after the Mumbai bomb blasts and she wanted to express the emotions of that time through this item. So in her composition the dancers, after enacting the nine avtaras, pray to God and implore Him to take the ultimate avtar 'KALKI AVTAR', to relieve the humans from the pain and the sufferings. Guru Vijaya Prasad brought her own original composition to this traditional song. In this composition Bala Krishna is watching the Gopikas perform Dashavtar and He enjoys watching his own avatars being enacted. SWARAJATIS :It is a combination of Jati and Swaras. It has a Pallavi and Chittaswarams. The aduvu's are complicated and there are variations in the rhythm. Javali in Kuchipudi has a rare charm of its own as more importance is given to abhinaya. Also "Satvika abhinaya" is depicted with great diligence. This item is based on the famous Kannada song of the same name. This item depicts Lord Shiva's anger through tandav and how Paravti's love and devotion transforms Shiva's rage to love and peace. Powada - "Maharashtra Bhumi Pawana"
Sant Dnyashawara's - "Om Namoji"
Shahir Honaji's Bhoopali - "Ghyanshyam Sundara"
Sant Ramdas 's - "Pahuniya Sita La"
Sant Namdev's - "Deva Tuja sathi"
Sant Tukarama's - "Kanya Sasurashi"
Emarath Phala "Ali Sant Krupa Zali". Its the first time any one has attempted an Dance Ballet on Navagraha. This Dance Ballet depicts the affect of each Nine Planets on the behavior of human beings. The ballet was written, choreographed and the music composed by Guru Smt Vijaya Prasad. 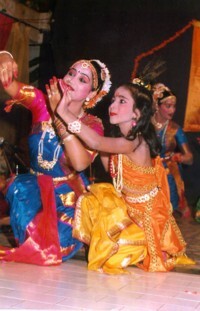 This ballet is based upon the Goddess Kanyaka Permeswari. The Ballet basically depicts the strength of woman as a whole through the legend of Kanyaka Permeswari. Traditionally in Kshetryia Padams only one Nayaki (character) is depicted. But Guru Smt. Vijaya Prasad composed this Kshetryia Padams where she depicted all four Nayakis. This item praises Lord Natraja who is symbolized as religion, art and science merged in one.. This item describes Lord Natraja's Limbs as the Universe, His speech as the sea of literature and His ornaments as the moon and the stars. This item portrays the sacred marriage of Lord Rama And Goddess Sita. This item describes how the people of Ayodhya celebrated the Marriage by singing , dancing and playing. This item portrays the sacred love of Radha and Krishna . This item is specially choreographed by Guru Smt. Vijaya Prasad and is dedicated to Lord Krishna. This item depicts Lord Shiva's role as the Creator and the Destroyer.